I've probably upgraded, downgraded, and reloaded the OS on every device I've ever owned more times than I can keep track of. However I've experienced a few bugs here and there over the years when restoring my third party applications. Sometimes Desktop Manager says there's a required update to the OS even after I just reloaded it, asks to downgrade BlackBerry Messenger, or has various compatibility or application load errors. When it comes to reloading applications it's always good to have choices. So in addition to AppLoader, BBSAK, and DM, there's another utility program out there that you can add to the list. BlackBerry 1-click installer (or BBOCI) by Bach Khoa University is an easy to use desktop program that allows you to quickly install third party applications to your device without using Desktop Manager or any other program for that matter. BBOCI gives you direct access to install and uninstall third party applications from your backup files with just a click of a mouse. That's it, no other programs needed as it uses its own javaloader. The only thing you need is your device, a USB cable, and the application files you've created by performing a backup with Desktop Manager. Basically, the middleman is being cut out of this equation giving you full control to automatically flash the apps back onto your device. Application files can be obtained in a variety of ways and are stored on your computer. BBSAK - Creates individual application COD files in a directory on your PC. 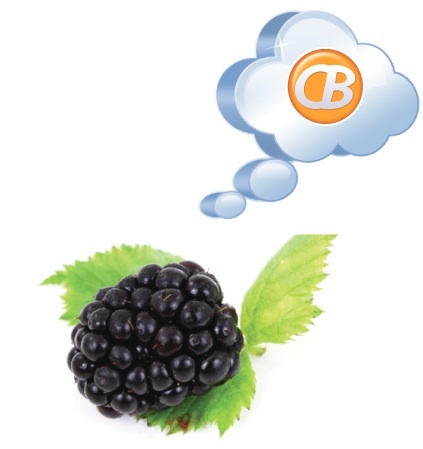 CrackBerry App Store - Download the file from your order email (OTA JAD file), directly from your account on the website (zip file which contains the COD file, if available), or from any other website's OTA site from your PC. Desktop Manager - Performing a third party application backup generates COD files of each of your applications and the ALX (application loader) file that DM uses to load one or all of them. First things first, you'll need to download, install and activate the program on your computer. 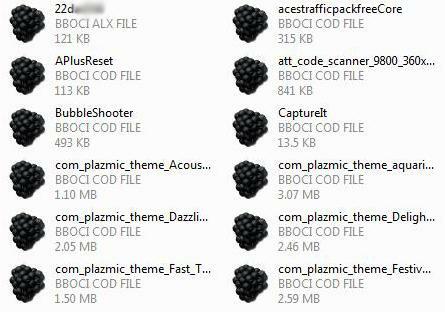 Double click on the executable file, register the program and instantly you'll notice that the COD, ALX, and JAD files will change into little BlackBerry icons. Basically, all the file extensions on your PC ending in JAD, COD, and ALX will now open with BBOCI. No need to panic as you'll still be able to open the files in DM, AppLoader or BBSAK and can unregister the program at any time. The process itself is simple: all you need to do is click on any one of these file types, verify your BB is connected, and choose either to Install to BB or Remove from BB. Within seconds, your program is loaded onto the device without even needing to reboot except when removing applications. Users have the option of installing each COD module individually, using the ALX file created by Desktop Manager during a backup to restore all, or using the JAD file from an OTA download. This way, we can bypass DM completely and load whichever application we want, whenever we want. However, I did have trouble loading JAD files onto my device. I tried on two different computers and with two different devices but it appears that JAD's will only uninstall the application, not install it. In addition, users might encounter some problems with applications that require multiple COD files. Unless you know exactly which files to install individually or wrote down the modules names listed in the applications options menu, you will need to use the ALX file to install. To fully test, I decided to take my Torch 9800 and perform a complete wipe and reinstall using BBSAK as referenced above. Using BBOCI, I was able to restore all my third party applications with DM's ALX file and experienced no errors or complications. Also, I purposely used an older backup file and loaded my missing themes individually by clicking on their corresponding COD files. I must warn you that the device does reboot after restoring each theme but not with apps. I'm impatient and anything that lets me avoid waiting for Desktop Manager to reconnect with my device is definitely a plus. What's great about BBOCI is how easy it is to add just the application you need rather than weeding through multiple backups or experiencing DM errors. I was able to install an app I just backed up the week prior that DM deemed incompatible. Plus, I didn't have to face the dreaded update required screen or downgrade my BBM. While there is room for improvement, it is convenient and, with the exception of JAD files, perfect for when you need an alternative method to load your third party applications. BBOCI v.2.0 is available at the CrackBerry App Store for $1.99 for all BlackBerry devices and for PC’s with Windows XP/Vista/7. It is currently on sale for $0.99 until February 28th.